"Let me ask you a silly question: Have you ever seen a woodblock print before?" ukiyo-e printmaker David Bull asked me. "Of course you have. But do you know how to look at a woodblock print?" He held a postcard-sized print under the fluorescent light in his cluttered kitchen. "Is that a woodblock print, or is it printed by a machine, or is it a photograph? We really can't tell under modern, vertical illumination," he said, pointing out that when the ukiyo-e genre devloped, during the early Edo period (1603-1868), the primary light source under which woodblock prints were designed to be viewed was sunlight, filtered horizontally through shoji (paper screen doors). Switching off the light, Bull angled the print slightly toward the window so that it caught the late afternoon sunlight. The previously flat planes and edges seemed to spring off the paper, taking on form and deepening in colour, as if the warmth of the sun's rays had infused life into the picture. "Now look at it! Is that the same thing we were looking at?" Bull asked rhetorically. When I admitted that the print appeared almost three-dimensional under natural light, Bull was delighted. "It is! It is three-dimensional! That's my point: I don't make pictures - I'm a sculptor!" Bull has just successfully completed an ambitious 10-year project to reproduce prominent ukiyo-e artist Katsukawa Shunsho's set of illustrations of the classical waka (31-syllable poem) anthology 'Hyakunin Isshu' (Single Poems from 100 Poets), published in book form in 1775. Thought to have been compiled by poet-scholar Fujiwara no Sadaie (1162-1241), also known as Fujiwara no Teika, shortly before his death, the anthology formed the basis for the popular card game uta karuta (poem cards), which is still played as part of New Year's festivities. Each of Shunsho's Hyakunin Isshu prints reproduces in elegant, highly cursive calligraphic form one of the 100 poems alongside a realistic portrait of the poem's author - realistic in stylistic sense because most of the poets whose works were immortalized in the series died centuries before Shunsho began his book of prints, and their likenesses are purely the products of the artist's imagination. Bull set himself the task of reproducing, as faithfully as possible, Shunsho's prints. Tall and skinny, with a helmet of tangled brown hair, a long, graying beard and piercing, bird-blue eyes, Bull looks like a cartoonist's caricature of an artist. But despite abundant evidence to the contrary, in the shape of prints, sketches and paintings pinned and taped to every available inch of wall in his modest apartment, Bull denied having any artistic pretensions. "The printmaking process is very simple: you get a piece of wood, you carve a shape, you put some colour on it, you press the paper on it, you have a print," he said. While this description is accurate in essence, it hardly conveys the extraordinary level of craftsmanship required to make the intricate detailed cherry wood key blocks, each in itself a work of art. Born in Yorkshire, England, in 1951, Bull emigrated with his family to Canada when he was 5. Having spent his 20s pursuing a peripatetic musical career, he found himself becoming absorbed with things Japanese - particularly ukiyo-e. In 1980, with no formal training whatsoever, Bull made his first woodblock prints. During a three-month trip to Japan in the winter of 1981-82, he acquired "enough basic knowledge to move forward." Armed with supplies purchased in Japan, Bull continued to hone his printmaking skills. 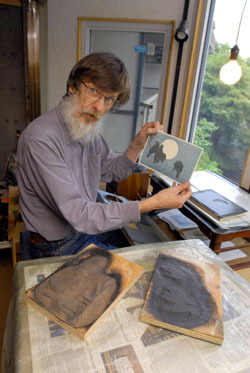 In 1986, he moved to Japan to acquire the techniques of the top professional printmakers here. Since 1988, Bull has produced 10 prints in the Hyakunin Isshu series each year, spending an average 80 hours carving the blocks for each. He sells the prints by subscription in one-year sets. Until recently, the bulk of the subscribers to the series were Japanese, but since he opened a Web site on the Internet in the summer of 1997, Bull has begun to receive orders from around the world. He is currently writing a comprehensive 'Encyclopedia of Woodblock Printmaking' which he intends to publish on the internet to help publicize the craft. The fruits of Bull's labours are currently on display at the 10th Annual Hyakunin Isshu Hanga Series Exhibition at Gallery Shinjuku Takano in Shinjuku, Tokyo. As well as enjoying wall-mounted prints, visitors to the exhibition will be able to view prints under the Edo-era lighting conditions for which they were originally designed - a room will be constructed in a corner of the gallery fitted with shoji screens through which artificial light will be shone to mimic daylight luminosity, revealing the hidden beauty of the works.